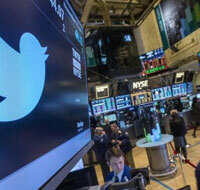 Investors piled into Twitter Inc for the second straight day, lifting its shares to more than $52 and setting a new intraday high on Tuesday even in the absence of any significant announcements from the social media debutante. Shares of Twitter were up 6 percent to $52.20 on Tuesday afternoon after a frenzied trading session on Monday, when Twitter closed up nearly 10 percent, its biggest gain ever. Since the loss-making San Francisco-based firm held its closely watched initial public offering last month, its fans on Wall Street have strained to reinforce the bull case for a stock priced at increasingly inflated multiples compared to social media peers like Facebook Inc and LinkedIn Corp.
Twitter has released a spate of management news and product updates since its IPO, but some announcements, such as the official roll-out of a lucrative, cookie-based ad targeting technology called "targeted audiences," have been preceded for months by prior announcements. In a research note on Friday, Evercore analyst Ken Sena said "targeted audiences" has been publicly in the works but raised his price target anyway from $43 to $52 because the deployment of the technology "might not be as costly as we originally modeled." Twitter which went public on the New York Stock Exchange on November 7, is now trading at roughly double its IPO price of $26 a share with an implied valuation of more than $26 billion on just $168.6 million in revenue in the third quarter. The San Francisco-based firm touched its previous intraday high of $50.09 on the day of its IPO.